A good way to stay on top of the quantity of items available in your store is by doing inventory of all products. Some stores do it weekly depending on the amount of products they stock and how fast they deplete. Owners can use a handy inventory spreadsheet to calculate totals in stock. The convenience store inventory list available on this page is an easy-to-use template. You can download it for free, and customize it to your needs. Compatible with Microsoft Excel 2013. Download the template to your computer and save to any folder you prefer or direct to the desktop for quick reference to the file. Locate the file and open it so you can start editing it with your own information. There are several columns that you can edit according to your inventory needs. The item titles in the columns include inventory ID, name, description, unit price, quantity in stock, inventory value, reorder level, reorder time in days, quantity in reorder, and a column for discontinued items. As you go through the rows on the convenience store inventory list you can replace the default listings with your own, and delete the details in the ones you do not need. Since the convenience store inventory list is simple to customize, you can also code the rows in colors of your choice. You can use specific colors for certain types of items to make it easier for you. For instance, if you sell school supplies, electronic items, over the counter medicine – among others – you can use a color for each group to quickly see stock availability for that item. You can also create a list for each group of items, print out the lists, and have other employees doing inventory for each group at the same time. Once done, you can update the details on the spreadsheet for all groups. Keeping inventory is an important task for all types of businesses that stock products. It allows you to notice what you are running low on so you can quickly place an order for more. 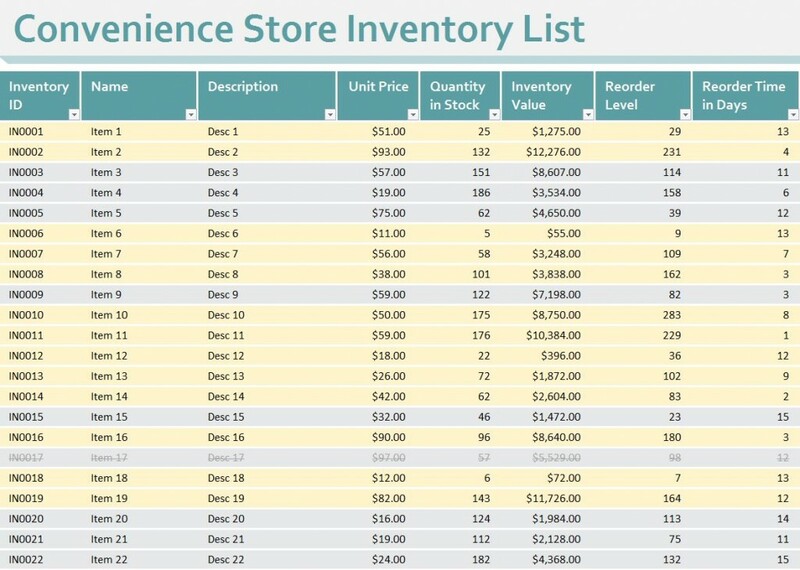 Using the convenience store inventory list template is an easy way to create your own spreadsheet to use at any time.